Richard Falk called, on Friday, for worldwide solidarity with the Palestinian struggle through boycott and divestment from companies profiting from illegal Israeli settlement construction. In a report originally published in Arabic on the UN’s website, special rapporteur on human rights in the Occupied Territories, Richard Falk, urged organizations and companies around the world to join in the “increasingly international solidarity movement against Israeli occupation”, Ma’an News Agency has reported. “Now is the best opportunity for the Palestinians to achieve self-determination through pressures at the grassroots level” and “nonviolent resistance,” said Falk. In addition, Falk expressed his disappointment over Israel’s expansion policies, which continued even throughout the US-brokered peace negotiations that lasted from July 2013 to April 2014. “The last round of talks created false hopes once again and fed frustration,” he said, warning UN member states against complicity in Israeli human rights violations in occupied Palestine. Richard Falk is an internationally recognized Princeton University professor of law. He has been met with harsh criticism for supporting the global Boycott, Divestment, and Sanctions movement and has publicly condemned Israel’s 2008 offensive against Gaza as “war crimes”. 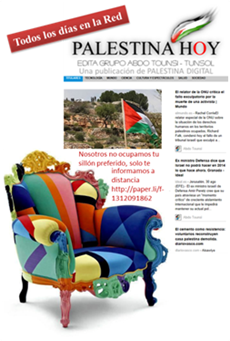 vía UN Official: Boycott Settlement Products Worldwide – International Middle East Media Center. 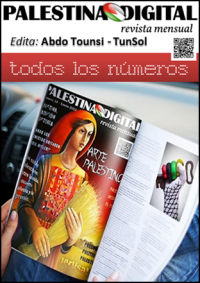 Esta entrada se publicó el 11/05/2014, 7:28 y se archivó como BDS, Crímenes del sionismo, DDHH, Palestina. Puedes seguir cualquier respuesta a esta entrada a través de RSS 2.0. Puedes saltar hasta el final para dejar una respuesta. Servicio de ping está actualmente deshabilidado.